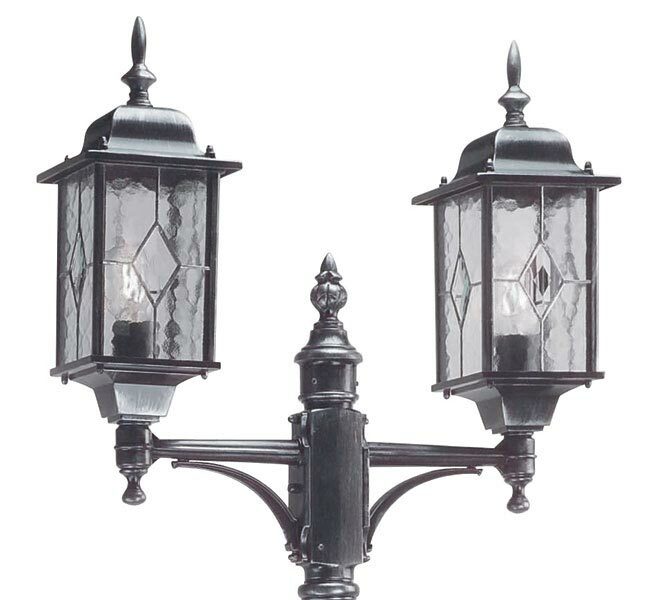 The Elstead Wexford 2 head outdoor lamp post in black and silver finish is traditional and rated IP43, with full height post and two leaded glass lanterns. Each lantern panel is made using five separate pieces of rippled glass that are then lead soldered together for a traditional look, with a feature chamfered diamond central panel. A substantial full height 2 light outdoor lamp post constructed from steel, with a three year finish guarantee. Part of the Wexford Traditional outdoor lighting range from Elstead Lighting. A quality outdoor 2 head lamp post finished in black with silver highlights and rated IP43.